The largest U.S. law firms spend $39,000 per lawyer each year to run their accounting and IT operations. Small law firms make do with just $12,000 per lawyer to run the same two back office tasks. Basic microeconomics suggest the numbers should be reversed with the smaller firms spending more per capita; not the other way around. · a private study conducted by PricewaterhouseCoopers’ Law Firm Statistical Survey of 31 large national law firms with 450+ lawyers (average size 781). A spending difference of $39,000 versus $12,000per lawyer would be astounding for any budget item. Even more remarkable is this $27,000 difference applies to two key back office functions: (a) accounting, where billing is performed and actionable financial data is generated to help manage the business and (b) IT, which includes the technology resources and support needed to execute daily legal work. Regardless of a law firm’s size, a $39,000 per lawyer budget is going to provide significantly greater quantity and quality support services than $12,000. Any 10 large firm lawyers can count on $390,000 worth of accounting and IT support, while an entire 10-person law firm is strapped with a $120,000 annual budget cap. 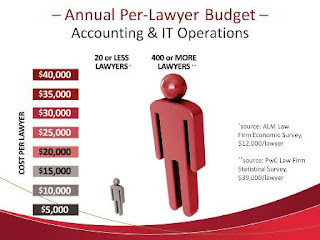 Yet despite the substantial per lawyer budget difference, small law firms require the same robust resources (technology and personnel) to run their practices and their business as their larger firm competitors. Think New York Yankees vs. Kansas City Royals. The Yankees are going to field a much different type of team, have a deeper bench of skilled players and related resources (e.g., training facilities; farm system) than the Royals. Nevertheless, the Royals are expected to compete despite the Yankee’s deeper pockets. 1) What extras do large firms enjoy as a result of the deeper pocket spending? 2) What steps can smaller firms take to level the playing field despite the spending difference? In response to the first question, large firms spend their additional money on more expensive support staff and software. Large firms typically field big help desk and training staffs and employ numerous individuals with MBAs, CPAs and other initialed credentials at various levels throughout their accounting and IT operations. They also tend to purchase more elaborate and sophisticated software (a) to handle their financial back office and (b) to make their lawyers more efficient and productive with case management, document management, version control and document assembly tools. Lacking a large firm’s deep pockets, small firms turn to small firm centric accounting and practice management systems, devoid of sophisticated financial and front office tools which the larger firms rely upon in hopes of obtaining better financial data and improved lawyer efficiency and productivity. As to what small law firms can do to narrow the spending gap (the second question), advances in cloud computing and desktop virtualization mean accounting and IT operations no longer need be performed in the same building or even the same city as the law firm’s front office. These technology advances make outsourcing a viable option for small law firms. Outsourcing permits small firms to obtain large firm accounting and IT resources, without making large upfront capital investments or adding large firm staff overhead. With outsourcing, small firms can call upon experienced former large firm CFOs, Controllers and IT Managers on a “time-share” basis; the type of staff commonplace in large firms but beyond the budget of most small firms. Seems like the tail is wagging the dog at BigLaw. As a client, I should not be paying for your accounting. All the more reason to use an smaller, specialized boutique firm. Smaller firms don't need "sophisticated" systems to maintain productivity and maximize equity partner profits.